All the scouts, including me, were lining up in the Kidzone. We were just about to leave for a hike organized by the scouts. 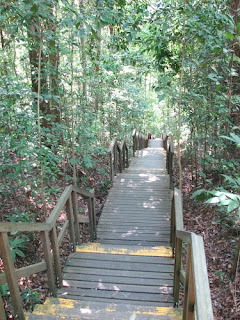 The hike was going to begin at Rifle Range and end at MacRitchie (Venus Road Carpark). The distance that we were going to hike for was about 5.5 kilometres. At about 7:30 a.m., we got onto our respective buses and off we went!!! At Rifle Range, we were given six assignments to do- write down 10 animals and 3 flowers that we saw, 3 sounds we heard, draw the Jelutong tower (a tower that we were going to see during our hike)and describe the Malayan Monitor Lizard, the biggest species of lizards ever found in the world. The hike was quite a breeze for me but a newcomer in my group did not. (This was because he was not very fit. )He was therefore at the back most of the time. As we trod on, I looked at the ground and tried to observe how I could complete my assignments. After hiking for one and a half hours, we reached a resting station- Rangers Station. That was where we sat down to eat our snacks and do our assignments. After a while, we continued our hike for another 2.9 kilometres. At about 11:50 p.m., we finally reached our destination and took the bus back to school. Personally, I enjoyed the hike and wish to hike more.